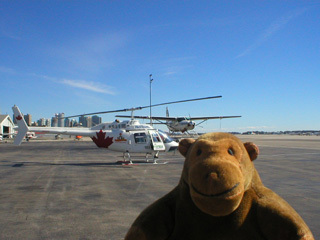 "Time to take to the skies, I think"
Mr Monkey examined the Jetranger helicopter very carefully before he got in, checking that all the bits that should spin were spinning, and all the bits that shouldn't spin weren't. 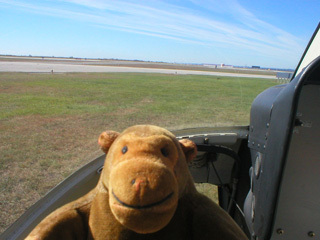 Then he scampered carefully around the front of the craft, and Mr Rik was strapped into the front passenger seat. Then, very smoothly, the helicopter tipped forward slightly, and started to rise.